Looking to add aesthetic appeal and more beauty to the garden? You may use garden rocks. No matter how dull or drab the landscape area, you can add more life and brightness to it by adding up garden rocks. It adds more value to the garden, and beauty to flower beds. To get the right effect, you must choose the best kind of rocks. If the garden area does not receive much of sun’s rays, you may use white rocks. Simply using landscaping rocks compliments the garden in a fabulous manner. The use of terracotta rocks to the garden with tropical flowers can give an island like feel to it. For those who are eyeing for a minimal look, they may simply go for black rocks. But, before choosing the rocks, do consider the theme of the garden. There are a variety of options in the garden rocks. Some of the best options are pebbles, granite, and permeable materials. They are sure to give the textural boost to the garden area. By incorporating colorful and beautiful stones into your garden, you are sure to make it the object of envy. Apart from beautifying the space, the stones can also lend textural appeal to space. It can also solve the drainage problems in the garden. In this section, you will learn about the various options in garden rocks. Decomposed granite is a sort of weathered rock material which is broken into tiny pieces. 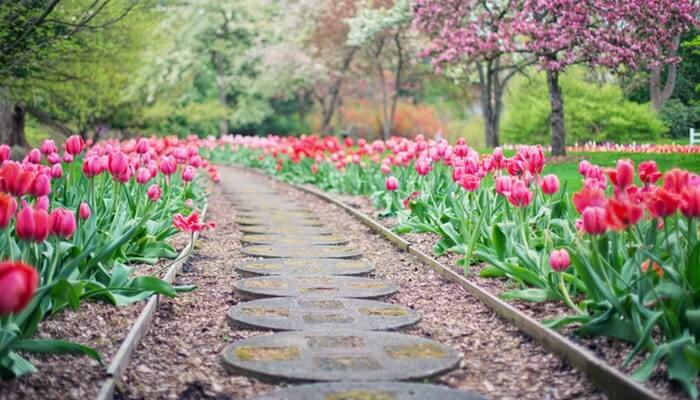 If you want to have rustic pathways and patios in the garden areas, you may opt for decomposed granite stones. Use it for topdressing arid plants and see the difference it makes. If you crush granite pieces, you have tiny granites which may be used for walkways and patio areas. Crushed granite is directly associated with decomposed granite. But, the material is heavy and rough in nature. Most of the owners of landscape area use it to attain that fabulous texture in the landscape area. You may say that it is pretty expensive but the result it yields is truly awesome. Beach pebbles are smooth, rounded and are meant to decorate the garden. You may use it for lining the patio and bordering the bed. You may use it to top dress the container plants. To attain elegant and sophisticated look in the garden, you can use beach pebbles. But, know one thing that the type of pebble or garden rock may be expensive. Pea gravels are again the garden rocks available in a variety of shapes and sizes. Common sizes are 5/8 inch, ½ and ¼ inch. Pea gravel can be used for pathways, patios and may be used between the flat rocks. What you need is broom to sweep back the gravel into place. If you are looking for something larger than pea gravel, you can choose river rocks. You may use river rock to come up with dry creek bed and use it for directing drainage. Make sure to maintain it consistently such that there is no such unpleasant cleanup. For that really kind of dry creek bed, you may look for river rocks of different sizes. To prevent the rocks from settling to the soil, you may use landscape fabric just below the rocks. If you want to create an eye-catchy garden space, choose decorative garden rocks. They are the ultimate tool for any landscaping professional. Boulders and artificial rocks might be used to save money and time. Artificial rocks are also a great way to beautifying a garden area.